The Kelly Ann Brown Foundation was started in honor of my Godmother. Kelly was one of the most generous and thoughtful people I’ve ever known and after she passed away those of us close to her wanted to continue her love and kindness through a foundation. Some of the grants given were brought to the board’s attention because they are wonderful causes, while others were Kelly’s passions. Kelly was one of the main reasons that I went to Annie Wright. She and my mother attended the May Day of 2001 to get to know the school and Kelly fell in love. May Day exemplifies what sets Annie Wright apart: our traditions that remain its core and keep all of us focused on inclusion and kindness. The entire school, from Kindergarten to the 12th grade, takes part in the May Day celebration. The May Queen, who the festivities surround, is crowned by her class as the woman who has shown the most kindness in her years there. Pop Culture associates the crowning of high school girls with the idea of ‘popularity,’ which, as the movie Carrie can tell you, has nothing to do with kindness. Annie Wright prides itself on being a pioneering school—literally. It was founded before Washington was a state, as a pioneering school. We were the first girls’ boarding school west of the Mississippi, and I believe we led from the beginning with a kindness that makes me proud of our century–old traditions. From my first day there, I was exposed to points of view and cultures I would otherwise not have encountered. Annie Wright isn’t just a boarding school for American students around the country, we house boarders from all over the world. All it took was that May Day for Kelly to know Annie Wright would be the best place for me. She waved away my mother’s fears of a high tuition with a quick ‘It will work out’ and headed to the Annie Wright store to load up on AWS gear, leaving my mother to sign the contract. Kelly truly believed in Annie Wright as a place where girls could learn and grow within a welcoming and uplifting community. She wore her AWS sweatshirt every time I saw her and always wanted to hear what I was up to there. The Foundation wants to ensure that other girls whose families cannot afford Annie Wright get the opportunity to attend; we know that’s what Kelly would have wanted. We hope the girls that receive the Kelly Ann Brown Scholarship at AWS will think of Kelly’s kindness, compassion, her thoughtfulness to all, especially the outsiders whom others, deliberately or not, often overlook. We are so happy that these young women have a chance to attend an exceptional school and we wish for them bright and shining futures! Her decision to attend Annie Wright changed Elly’s world. She left home, moved in with a roommate, donned a uniform and prepared herself for higher expectations in the classroom and a lot of homework outside it. One of the biggest changes was dorm life, but she’s already fallen into a routine: a uniform allows her to “get up and go” without much thought, before downing breakfast, and heading to her first class. She describes dorm life as a “nice condensed way to focus on my studies.” What motivates her to study? "I want to do well to prove myself to myself. Last year in school I was always wishing for more stuff to chew on and more stuff to do," she explains, before adding with a laugh, “and I got what I asked for!” Elly’s not just taking a bite out of her studies, she’s already joined the Cross Country team, plans to play basketball and is determined to join the tennis team in the spring. She does sports out of a love for being active: "I need to feel like I have something to focus on other than academics, and being outside and having fun makes me feel more alive in general." Back inside the classroom, Elly looks forward to US History which she describes as “a class that’s more like a conversation. It opens up the possibility of so many different viewpoints and it’s so cool to hear what everyone thinks about one topic.” She also loves the hands-on approach in her Chemistry class, explaining that she likes doing the experiments, not just reading about them. When Elly’s not literally running around for Cross Country, taking notes in class, or studying, she dives into piano and poetry. Elly loves music; she played the violin for 7 years before giving it up to continue her pursuit of the piano, which she’s been studying for 8 years. Elly also loves to write, connecting her two passions: “To me poetry is like music, except on paper.” Not everything has been easy about the move to Annie Wright: “I really, really love piano. That was one of the things that was really hard for me; my piano teacher was amazing, and not doing piano with her is not quite the same.” She also misses her hometown. She describes Cashmere, a small town between Wenatchee and Leavenworth, as ‘beautiful,’ adding, “I didn’t fully appreciate that until leaving and coming back.” She’s used to dry, desert mountains, patches of irrigated orchards and dirt roads. Everything’s spread out and quiet. Tacoma can feel crowded and grey: miles of concrete below and miles of overcast sky above. Cashmere is separated from Tacoma by the Cascades, the mountain range that keeps the rain in the west and the sun in the east. When asked if she likes Tacoma, she said “It’s ok, as far as cities go” and added she’d need to spend more time in the country before deciding to live in a city again. Her mom and brother come to visit often, rescuing her from the cement by taking her on long hikes around Mt. Rainier. She also looks forward to a weekend home once a month. Annie Wright isn’t just home to boarders from around the United States, it schools girls from around the world, including Korea, Japan, Germany, Spain and England. Her new friends from Seoul and Tokyo laugh at her describing Tacoma as a “big city” and have tried to convince her that Tacoma is in “the middle of nowhere.” One of the great, international lessons of Annie Wright is: Everything’s relative. We are happy to announce that Elly is the first of what will be a long line of Kelly Ann Brown Scholars. The Kelly Ann Brown Foundation Endowment Fund at Annie Wright Schools will provide funding for the Kelly Ann Brown scholarship in perpetuity. Click here to learn more about Annie Wright Schools. 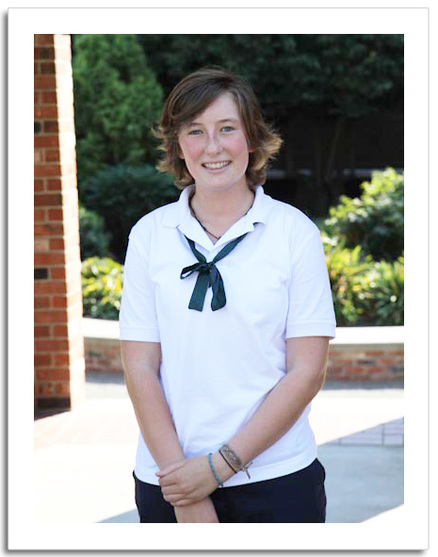 Read an update on Kelly Ann Brown Scholar Elly Ina here.